In this category, you will find necklaces, bracelets, earrings, machette buttons and brooches with a wide representation of time periods, styles, countries of origin and materials. The category offers jewellery from some of the most prominent jewellery houses, both internationally and nationally, such as Cartier, Bulgari and W.A. Bolin. Humans have been decorating their bodies with jewellery since ancient times, to mark social and economic status, religious and cultural affiliation, or as a decorative effect. 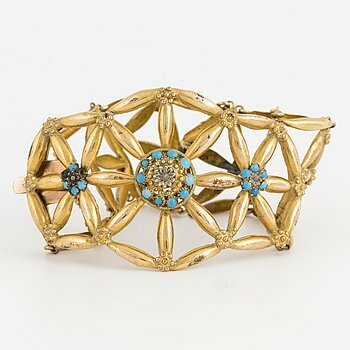 Bukowski’s jewellery segment offers everything from 19th-century pieces, finely worked filigree pieces and modern matched sets, known as ”parure”. We have made a selection of jewellery that you have the opportunity to buy direct at a fixed price. Cultured pearl necklace, 9K gold clasp with rose-cut diamonds and drilled pearl. 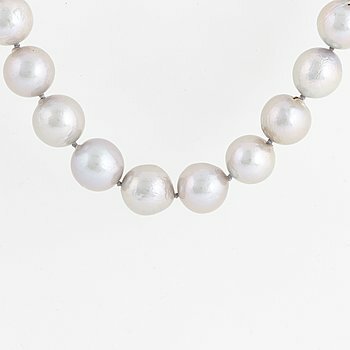 A cultured grey freshwater pearl necklace. 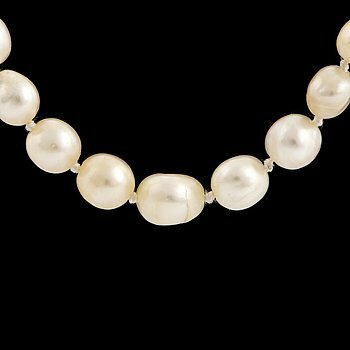 PEARL NECKLACE cultured pearls approx 7 mm w clasp in 18K whitegold w single-cut diamonds and 1 cultured pearl app. 5 mm. A 14K and low fineness gold bracelet set with blue stones. Two sterling silver rings by Per Waller, with quartz ond white stone. 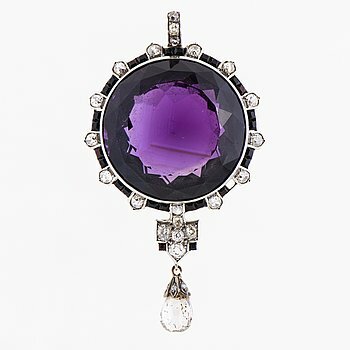 A PENDANT, facetted amethyst, old and briolette cut diamonds, square cut garnets, white gold. A RING, cultured pearls, 8/8 cut diamonds, 18K gold and white gold. Kuopion Kultaseppä, Kuopio Finland 1944. A RING, facetted emerald, 8/8 cut diamonds, 18K white gold. A. Tillander´, Helsinki Finland 1976. 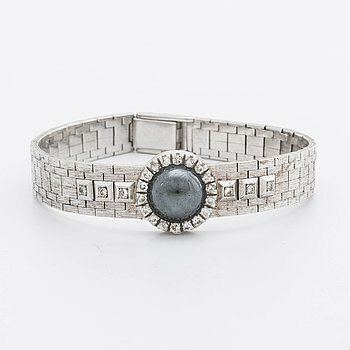 BRACELET 18K whitegold brilliant-cut diamonds 0,45 ct and hematite. Cultured pearl and eight-cut diamond cross over ring. Cultured pearl and faceted citrine bead necklace. A Lantz sterling silver ring. 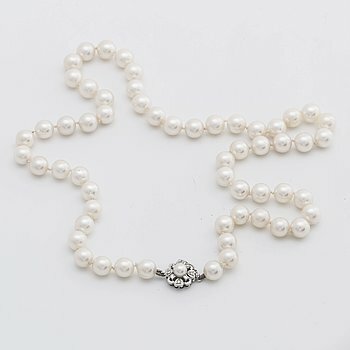 NECKLACE 18K gold w 9 cutured pearls approx 5,5 - 8 mm. A Maria Elmqvist sterlingsilver, gold and tourmaline ring. Art déco calibrated pearl necklace, clasp wih sapphire and diamonds. A pair of cultured South sea perl and diamond earrings. A RING, facetted topaz, diamonds, 18K gold. A. Tillander, Helsinki 2009. An aquamarine and diamond ring. A RING, cultured pearl, brilliant- and 8/8 cut diamonds, platinum. A. Tillander, Helsinki. Circa 1 ct oval diamond necklace. Bracelet, silver with cabochon porphyry cut. A Pomellato ring with checker-cut stone. 18K gold and pearl earrings. Calibre rubies, sapphires, emeralds and round brilliant-cut diamond bangle. Circa 1,30 ct brilliant-cut diamond necklace. An A.Tillander sapphire and diamond ring. A purple garnet and brilliant-cut diamond cluster ring. GEORGE JENSEN, Jacqueline Rabun, 'Cave' bangle, sterlingsilver and 18K gold. CARTIER ,'Tous Droits Reserves' 18K gold cufflinks. A BJÖRN WECKSTRÖM RING, 'Hidden agate', 14K gold, moss agate. Lapponia 1970. DIAMOND RING 18K gold 1 brilliant-cut diamond approx 0,20 ct.
GEORG JENSEN, pendant and chain, sterling silver, design nr 452A. A baguett and brilliant-cut diamond cross over ring. A BRACELET, facetted aquamarines, platinum. A BROOCH, enamel, brilliant cut diamonds, 18K gold. Milan, Italy 1968-71. A Lantz sterlingsilver ring with amethyst. Navette ruby and brilliant-cut diamond flower earrings. A pair of Paul Binder earrings in 18K gold and wood. A PENDANT, facetted citrine, 18K gold. A. Tillander, Helsinki Finland 1960. A GOLDEN CASE, 18K gold and white gold, square cut sapphires. Emerald and brilliant-cut diamond bracelet. 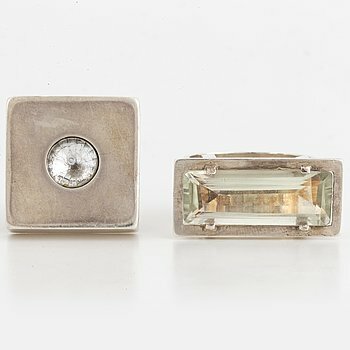 A Swedish 20th century pair of strling cuff links mark of Wiwen Nilsson Lund 1951, weight ca 12,4 gr, length ca 2,2 cm. An 18K gold Christian Dior pendant. Pendant and chain and bracelet 18K gold and cultured pearls, approx 7,5 mm and 3,5 mm. Cultured freshwater and small akoya pearl earrings. A citrine, garnet and synthetic ruby pendant. ENGELBERT, Set med armband, ring och örhängen 18K guld med cabochonslipade ametister och odlade pärlor. GOLD NECKLACE 18K gold and onyx, ca 15 g.
BRACELET 18K gold w single and brilliant-cut diamonds approx 0,65 ct in total. Cabochon-cut emerald and brilliant-cut diamond cluster ring. Ateljé Stigbert bangle with pearls. Cabochon-cut sapphire and brilliant-cut diamond earrings. A NECKLACE, pendant H. Stern, facetted topaz, 18 and 14K gold. TEO PAIRS OF DIAMOND EARRINGS, 18k whitegold 4 brilliant-cut diamonds approx 0,20 ct in total. BRACELET 18k gold, 23,7 g.
A PAIR OF CUFFLINKS, 14K gold. Tammen Koru, Turku 1969. A pair of cultured South sea perl earrings. A RING, old cut diamond, 18K gold. A RING, facetted emerald, brilliant cut diamonds diamonds, 18K gold and white gold. RING 18K whitegold w 17 brilliant-cut diamonds 0,255 ct in total, River (E) VVS invoice, Butler Malmö 2014, original box. EAARINGS 14K whitegold approx 1,5 ct in total approx N-O very light brown, Inclusions. 18K gold and blue stone ring by Jürgen Girgsdies. A cultured pearl necklace, 18K white gold clasp with eight-cut diamonds. 18K gold and pearl bracelet. A RING, brilliant cut diamond, 18K white gold. A. Tillander, Helsinki Finland 1998. A BROOCH, Art Deco, old and 8/8 cut diamonds, platinum. A BRACELET, 18K gold in three colours, cabochon cut chrysoprase. A pair of cultured Tahiti pearl and brilliant-cut diamond earrings. A BRACELET, cultured pearls, 14K gold. Westerback, Helsinki 1965. A RING, old cut diamonds, enamel, 18K gold. England c. 1860s. 18K white godl and ruby and brilliant-cut diamond. Large cabochon-cut garnet, enamel, pearl and rose-cut diamond bangle. 18K gold, citrine and brilliant-cut diamond ring. A brooch/pendant 18K gold, Peru. 18K white gold and diamond bracelet. 5 CHARMS 18K and 14K gold, blue, red, green stones. BRACELET 18K gold , 22,5 g.
Oval faceted ruby and brilliant-cut diamond earrings. A LOTTA ORKOMIES RING, cabochon cut ruby, 18K gold. A. Tillander, Helsinki Finland 1981. A Elon Arenhill 18K white gold bangle. CHANEL, a pair of push back earrings. 18K gold and sugarloaf-cut amethyst bangle. Aquamarine and brilliant-cut diamond ring.